Located within Chena Hot Springs Resort approximately 56 miles from Fairbanks, Alaska, the Aurora Ice Museum is the largest year-round ice display in the world, featuring sculptures created by world champion ice carvers Steve and Heather Brice. Though the waters of Chena Hot Springs have been used by the indigenous people of Alaska for centuries, recorded use of the area’s hot springs dates back to 1904, when a United States Geological Survey crew noted an incidence of rising steam from a valley near the Chena River. Though it was assumed that the steam was from a natural geothermal hot springs, the surveyors did not pursue further investigation, but in July of the following year, gold miners Robert and Thomas Swan learned of the findings and set out to investigate, hoping to find a way to alleviate Robert’s rheumatism pain. After a month of searching, the Swan brothers located the hot springs area on August 5. Over the following years, they developed a small resort property on the area, including a bathhouse, stable, and 12 visitor cabins. Throughout the 20th century, the hot springs grew to become one of the most popular resort areas in interior Alaska, developing such a reputation for its unique waters that chemists from the United States Department of Agriculture was sent to study its properties. Conclusions from the study showed that the waters were markedly different in chemical makeup than other American hot springs, showing similarities to famed hot springs areas in the Czech Republic due to its high content of sulfate, chloride, and sodium bicarbonate. Steve Brice was born in Fairbanks, Alaska, though his family moved to Clarksville, Georgia when he was a small child. As a self-taught sculptor, Steve originally worked with plasticine sculpting but developed an interest in ice sculpting after assisting with a project for Ice Alaska in 1990. Heather Brice, a Fairbanks native, was a student of Wendy Croskey when she reached out to Steve to assist him on his World Ice Art Championship team in 1998. As a married couple, Steve and Heather have won a combined total of 23 world ice art championships and have designed prominent ice sculptures for cities and events around the world. 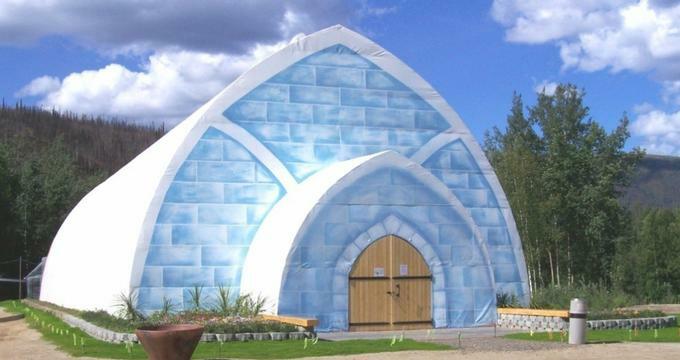 Following their work at the 1996 World Ice Art Championships, Steve was approached by Chena Hot Springs Resort owner Bernie Karl, who proposed the idea of creating an ice museum for the resort. A temporary facility, designed by Steve and Heather, was created in 2003, but melted with spring weather the following year. The first ice museum facility was rebuilt as a permanent structure in 2004 and opened in January 2005 as the Aurora Ice Museum. Today, the Aurora Ice Museum is the largest permanent ice museum in the world, temperature controlled at 25 degrees Fahrenheit year-round. More than 1,000 tons of ice were used in the museum’s creation, harvested from other areas of the resort. An original patented absorption chiller cools the ice throughout the summer months. All sculptures within the museum’s gallery, including a two-story observation tower with a circular staircase and polar bear, Christmas tree, and children’s fort bedroom areas, were created by Steve and Heather Brice. Colored ice crystal chandeliers suspended from the building’s ceiling depict the area’s famous Aurora Borealis lights. An Aurora Ice Bar area, furnished with caribou fur stools and an ice sculpted fireplace, offers custom appletini adult beverages served in an ice-carved martini glass. The Aurora Ice Museum is open 365 days a year, with tours embarking every two hours throughout the operating day. Tickets for tours must be purchased more than 15 minutes in advance at the Chena Hot Springs Activity Center Desk, including special tickets for appletinis at the Aurora Ice Bar. Tour admission for children under five is free with admission of a paying adult. Complimentary parkas are available for all tour participants during their exploration of the museum. As the museum’s resident ice sculpting artists, Steve and Heather Brice conduct regular ice sculpting and ice carving classes, held as two hour sessions for up to three students at a time. A two-night Ice Sculpting Extravaganza package is also offered by Chena Hot Springs Resort, subject to availability. All extravaganza tours include transportation to and from Fairbanks, a two night stay at the resort’s Moose Lodge, a swimming pass for the resort’s pools, and five complimentary meals. Seven hours of ice sculpting lessons with Steve and Heather are also incorporated throughout the schedule of the three-day tour at instructor availability. All extravaganza packages must be booked at least 72 hours in advance through Chena Hot Springs Resort, and all activities are weather-permitting.